What Is A Screenplay Option Agreement & How Does It Work? Many thanks to Bang2writers Eileen, Neil, Jordan and Elle who’ve all emailed or left messages asking about screenplay options recently. 1) Rights. The writer assigns the producer or filmmaker the rights (or ownership) of the screenplay and/or story behind it for a limited time. 2) Exclusive. The Producer buys that time for a certain amount of money, for “exclusivity”. The screenwriter is not permitted to work on that screenplay with anyone else during that time. 3) Revert. At the end of that time period, if the producer has not made the film of the screenplay, the rights revert back to the screenwriter, who is then able to sell the rights again if s/he chooses to. When you’ve signed an option with a producer, that producer will usually work with you to make your screenplay more marketable for investors and/or other funding opportunities. This is why it’s a GREAT idea for screenwriters to be clued up on how the industry works and what’s out there, so they can work out whether the producer who wants their screenplay is the real deal or not. Check out the Film Investment bundle of The B2W Required Reading List for more articles and info on this. 1) How long a time period is it for? Typically, an option agreement will last between six months and five years, though I’ve seen shorter AND longer. Generally speaking, options should only be on the longer side if the person who wants your screenplay has parted with cold hard £. Avoid signing free options for long periods – 6 months to 1 year is typical, which I think a fair amount of time for the producer to develop your project with you and work on raising the funds to make it. Sometimes options cover just the screenplay, not the story (or vice versa) and sometimes, it will cover other mediums too like novel tie-ins, transmedia opportunities and so on. 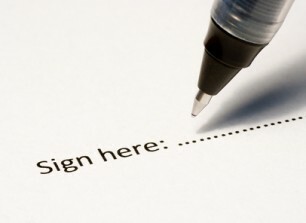 Make sure you check what the option is for specifically, before signing on the dotted line. In terms of money, find out whether you are paid a fee upfront or not; how much it is and when you get it. Payments are frequently split into two or even three instalments, ie. payment on signature of the agreement; a payment on acceptance of first draft; plus a payment on the first day of principal photography. If the option promises a deferred payment, watch out for dodgy phrasing like payment promised when the project “goes into profit”, since many don’t officially. If you’re signing a free option, make sure there’s a specific advantage to doing so, ie. the producer or filmmaker has a good track record getting projects off the ground, so this could help kickstart and/or develop your career in some way (ie. by creating contacts/relationships and so on). Essentially, a screenplay option is a contract that lays out what money is available and when; what you as the writer can and can’t do; plus what the producer can and can’t do; within what timeframe and to what end. That’s it. So as you can see, it’s not rocket science: if you’ve ever had a phone or internet contract, or a tenancy agreement between you and a Landlord (or vice versa), then a screenplay option is very similar. What Is The Difference Between An NDA And A Release Form? When Should I Talk About Writers’ Rates? Won’t Someone Nick My Script Or Idea? One Response to What Is A Screenplay Option Agreement & How Does It Work? Thank you for this. Helped clear things up. Here’s another very good article I found on the subject.